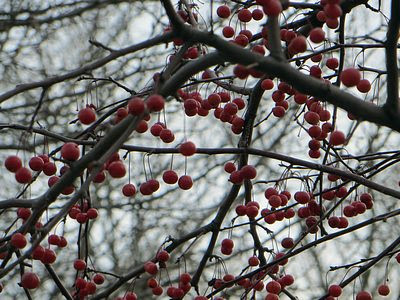 On the morning of New Year's Eve day, I went out with my new camera and my iPod for a stroll through Brooklyn Bridge Park and Brooklyn Heights. Here are photos I took along the way, as well as a log of what I was hearing. 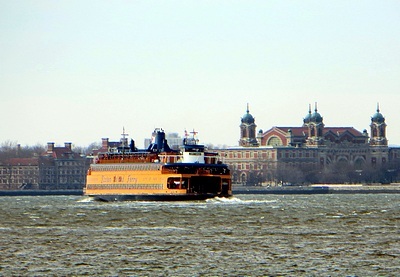 The photo above was taken from the Park's newly opened Pier 5. 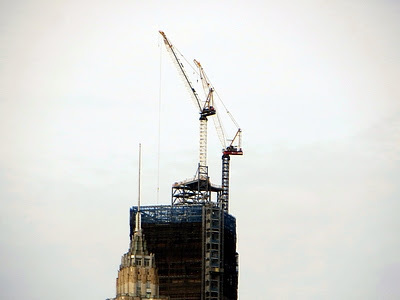 It shows the top of the new One World Trade Center (David Childs, Skidmore, Owings & Merrill), still under construction and already the tallest building (but not the tallest tower) in the Western Hemisphere. In front of it, and appearing almost as tall because it is closer, is 66 story 70 Pine Street (Clinton and Russell, Holton & George, 1932), originally built for oil and utilities giant Cities Service, then acquired by insurance behemoth AIG (which had a near death experience in the financial crisis of 2008), and now owned by a Korean investment company. It typifies the high art deco style of the 1920s and '30s. The Flying Burrito Brothers, "Christine's Tune": my walk begins with the first cut on The Gilded Palace of Sin, the first album by the group formed by Gram Parsons and Chris Hillman after they left the Byrds. Chris takes the lead vocal on the first verse, Gram on the second. Video here. Wynonie Harris, "Rotgut": jump blues from the early 1950s by a classic shouter. Hear it here. John Mayall, "Bernard Jenkins": this blues instrumental features Eric Clapton, who was part of Mayall's seminal group Bluesbreakers in 1965-66, on lead guitar. Listen here. 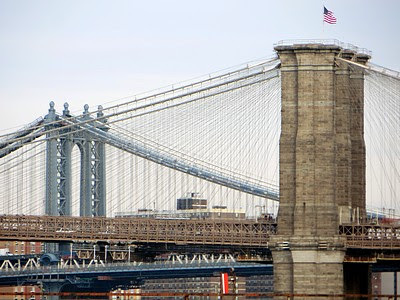 The east tower of the Brooklyn Bridge (John A. Roebling, 1883) and the west tower of the Manhattan Bridge (Leon Moisseiff, 1909), also taken from Pier 5. Billy Grammer, "Gotta Travel On": I remember hearing this on our car radio as my parents and I were moving to Tampa in 1958. Watch a live version here. Tracy Nelson, "I Need Your Love So Bad": some years ago I was at the bar of the Lion's Head and got into conversation with a woman sitting next to me. She told me she was a blues singer. "What's your name?" I asked. "Tracy Nelson." I think she's amazing. There's no video of her superb cover of this Irma Thomas hit, but here's one of "Walk Away." The Staten Island ferry John F. Kennedy passes Ellis Island, historic reception place for immigrants, seen from Pier 5. The Mystics, "Hushabye": in 1959 five young men from Brooklyn had a hit with this uptempo but soft doo-wop song written by the now legendary duo Doc Pomus and Mort Shuman. The Mystics continued to perform together over the years; here they are on WLIW-TV in 2007 doing a faithful rendition of their hit. 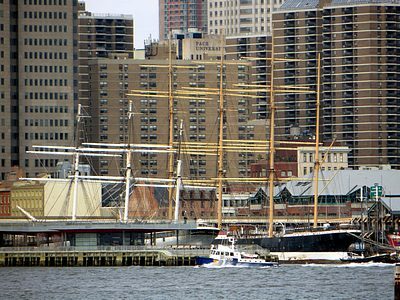 South Street Seaport Museum's tall ships Wavertree and Peking, also seen from Pier 5. Paul Butterfield Blues Band, "Spoonful": "Buttter" put together a racially integrated band that brought the raw sound of Chicago blues to a predominantly white audience of college students, myself included. This is their cover of a song written by Willie Dixon and first recorded by Howlin' Wolf. Vampire Weekend, "Mansard Roof": And now the tops of buildings I can see them too. You're going to see more of the tops of buildings in this post, as I test the 20X zoom lens on my new camera. Here's a video of the group doing the song. I love these guys. 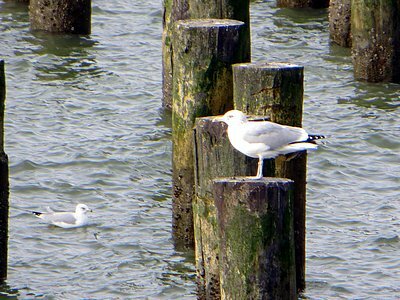 Seagull on piling; seagull in water. 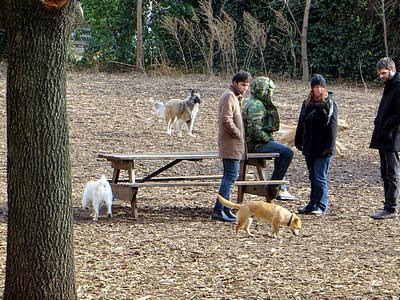 Near south end of Pier 1, Brooklyn Bridge Park. Tom Russell Band, "Hong Kong Boy": He's got a thousand dollar gold watchband, boots made of watersnake skin/ A diamond cross in his left ear, there's no mistaking him. No video available, but you can hear a sample here. The Holy Modal Rounders, "Flop Eared Mule": the original Holy Modal Rounders, Peter Stampfel and Steve Weber, were described by someone as "the originators and sole exponents of the genre known as acid-folk." I was listening to their recording of this from the 1960s, of which there is no video or on-line recording available. Here is a video of a live, very frenetic performance by Stampfel, the surviving original Rounder, with several accompanying musicians. 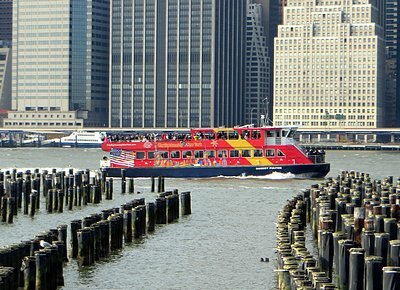 The ferry Robert Fulton passes the pilings at the south end of Pier 1. The gaps between the rows of pilings show where subway tunnels pass under the East River. Rolling Stones, "No Expectations": Here's a live performance video from Holland in 2003. Perhaps this should be the new Mets' theme song. The Boys of the Lough, "The Hound and the Hare": a lovely song, from the Live at Passim album, that ends with the instruments breaking into an eerily accurate imitation of the sound of a pack of hounds in pursuit. I heard the Boys in concert in the late 1970s, and got to meet the great Shetland fiddler Aly Bain because my date was his sister-in-law. There's no video, but you can hear a sample here. 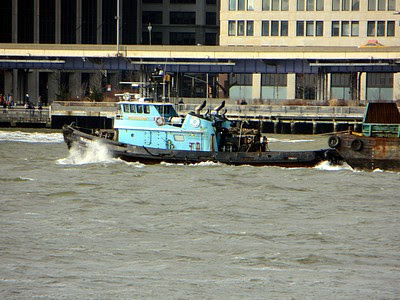 Meagan Ann pulls a barge downstream past Pier 1. 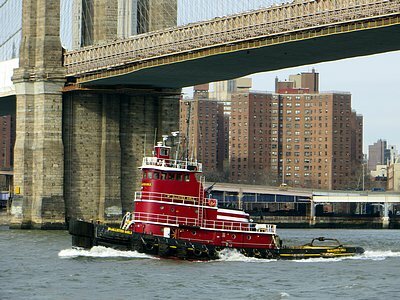 Lou Killen, "Row Bullies Row": a classic by the modern master of the sea chantey, appropriate for watching East River traffic. Listen to a sample here. 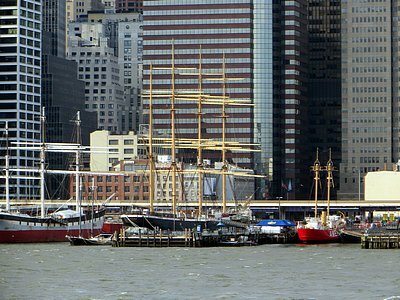 Another view of the South Street Seaport's fleet, this time from Pier 1. The Ambrose lightship is at right, and the schooner Pioneer lies astern of the tall ship Peking. The Angels, "My Boyfriend's Back": mid 1960s girl group R&B par excellence. Video here. The top of the Municipal Building (William M. Kendall, McKim, Mead and White, 1914) as seen from Pier 1. 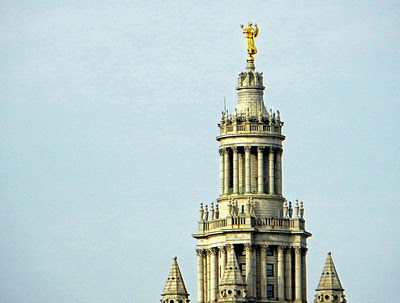 The gilded statue on top is Adolph Weinman's Civic Fame, showing her back to Brooklyn. 10,000 Maniacs, "Maddox Table": video, and my commentary, here. McAllister Girls (not to be confused with McAllister Sisters) passes under the Brooklyn Bridge. Kingston Trio, "Leave My Woman Alone": the Trio did a wide variety of music, ranging from Hawaiian drinking songs to Appalachian ballads to African hunting songs; here they sing the blues. There's no video of the Trio doing this song, but here's a quartet of Tokyo Trio enthusiasts doing a rousing and, I think, convincing cover. Cheap Trick, "Surrender": I often woke up to this song when my clock radio was tuned to WNEW-FM during the 1980s. Live performance video here. Coro e Orchestra di Teatro Comunale di Fiorenza, Ricardo Muti, cond., "Va, Pensiero, Sull'Ali Dorate": this chorus from Verdi's Nabucco, in which the exiled Israelites long for their homeland, was once described to me as "the unofficial Italian national anthem." Indeed, the first time I heard it, someone in the audience yelled "Viva Italia!" at the end. Video by the chorus and orchestra of the Metropolitan Opera here. The 1824 vintage Eugene Boisselet House, at the corner of Middagh and Willow streets. 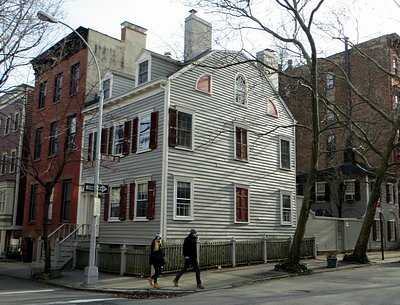 Not the oldest house in Brooklyn Heights, but in the words of Francis Morrone, "it is hard to imagine a more perfect specimen of the Federal style frame house." (An Architectural Guidebook to Brooklyn, Gibbs Smith 2001). James Brown, "You Don't Have To Go": from the great "Roots of a Revolution" album that includes many of his earliest recordings. Hear a later version here. Art deco details on the upper stories of the Cranlyn apartment building (H.I. Feldman, 1931), at the corner of Cranberry and Henry streets. 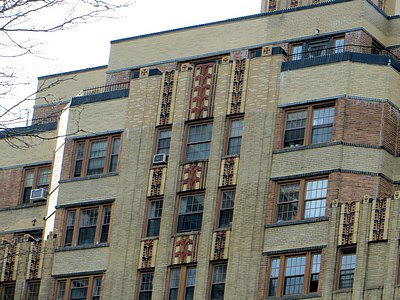 Like 70 Pine (first photo) it is a good example of prewar high deco. The Beatles, "If I Needed Someone": a gem from Rubber Soul; video here. Iggy Pop, "The Passenger": a favorite of my late friend Charlie McCrann, maker of Bloodeaters aka Toxic Zombies aka Il ritorno degli zombi. Here's a live performance video from the Manchester (England) Apollo in 1977. Charlie Musselwhite, "Leaving Your Town": great harp, great vocal. Listen here. The Tarbox Ramblers, "Jug Band Music": "It sounds so sweet, yes, it's hard to beat." Listen to a sample here. 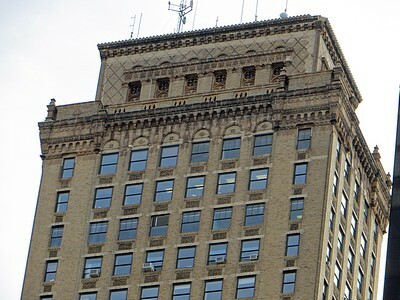 The top of the 38 story office building at 16 Court Street (H. Craig Severance, 1927). 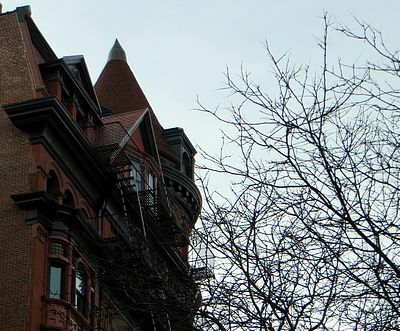 This building, until recently the second tallest (after the Williamsburgh Savings Bank Tower) in Brooklyn, is identified in old mariners' charts of New York Harbor as the "Flat Top Building." Lightnin' Hopkins, "I'm Wit' It": a lively little blues guitar number. Hear a sample here. 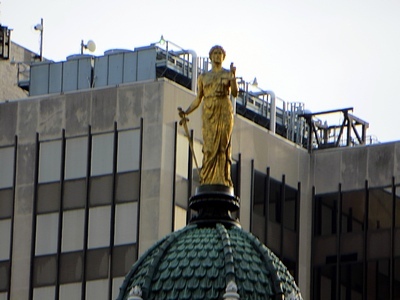 This gilded statue, "Lady Justice'" stands atop the cupola of Brooklyn Borough Hall (Calvin Pollard/ Gamaliel King, 1851). The original wooden cupola was destroyed by fire in 1895 and replaced by a new cast iron one (Stoughton & Stoughton/ Vincent Griffith) in 1898. The statue, part of the original design, wasn't placed atop the cupola until 1988. Tom Rush, "Love's Made a Fool of You": an able Buddy Holly cover by one of my favorites of the folkie generation that came to prominence in the mid to late 1960s. Hear the original, by Buddy and the Crickets, here. Tom is alive, well, and still singing. Arlington Apartments, 62 Montague Street (Montrose W. Morris, 1887). The tower and turret on this building is one of the first things I see as I walk out of the building in which I live just across the street. The Flying Burrito Brothers, "Sin City": I began my walk with the first cut from their first album, and ended it with the second cut. Lovely harmonies by Gram Parsons and Chris Hillman, over the dreamy pedal steel of Sneaky Pete Kleinow, he of the pterodactyl Nudie suit.